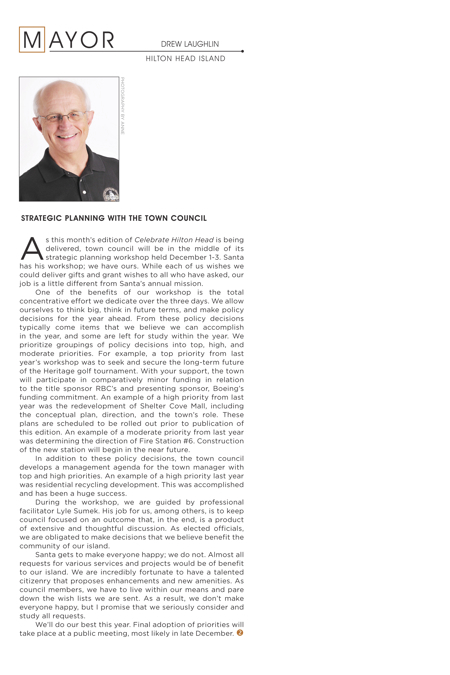 As this month’s edition of Celebrate Hilton Head is being delivered, town council will be in the middle of its strategic planning workshop held December 1-3. Santa has his workshop; we have ours. While each of us wishes we could deliver gifts and grant wishes to all who have asked, our job is a little different from Santa’s annual mission. One of the benefits of our workshop is the total concentrative effort we dedicate over the three days. We allow ourselves to think big, think in future terms, and make policy decisions for the year ahead. From these policy decisions typically come items that we believe we can accomplish in the year, and some are left for study within the year. We prioritize groupings of policy decisions into top, high, and moderate priorities. For example, a top priority from last year’s workshop was to seek and secure the long-term future of the Heritage golf tournament. With your support, the town will participate in comparatively minor funding in relation to the title sponsor RBC’s and presenting sponsor, Boeing’s funding commitment. An example of a high priority from last year was the redevelopment of Shelter Cove Mall, including the conceptual plan, direction, and the town’s role. These plans are scheduled to be rolled out prior to publication of this edition. An example of a moderate priority from last year was determining the direction of Fire Station #6. Construction of the new station will begin in the near future. In addition to these policy decisions, the town council develops a management agenda for the town manager with top and high priorities. An example of a high priority last year was residential recycling development. This was accomplished and has been a huge success. During the workshop, we are guided by professional facilitator Lyle Sumek. His job for us, among others, is to keep council focused on an outcome that, in the end, is a product of extensive and thoughtful discussion. As elected officials, we are obligated to make decisions that we believe benefit the community of our island. Santa gets to make everyone happy; we do not. Almost all requests for various services and projects would be of benefit to our island. We are incredibly fortunate to have a talented citizenry that proposes enhancements and new amenities. As council members, we have to live within our means and pare down the wish lists we are sent. As a result, we don’t make everyone happy, but I promise that we seriously consider and study all requests. We’ll do our best this year. Final adoption of priorities will take place at a public meeting, most likely in late December. The May River Watershed Action Plan was adopted at the November town council meeting after many months of preparation and feedback from the community. Council saw the need of this action plan, because the town saw a very fast-paced development over the last decade. The most recent census figures show that the town of Bluffton has seen an 883 percent population growth. This is only in the incorporated areas; add in the population in unincorporated areas of the town, and the increase was much greater. In 2009, shellfish beds in the May River Watershed closed for harvesting. The May River is the number one amenity in our town and is the reason all of us call Bluffton home. To keep this river clean and healthy, council directed staff to begin the process of creating this action plan. To help implement this plan and look at the testing that is being done, the town also created two committees: the May River Watershed Implementation Committee and the Technical Advisory Committee. 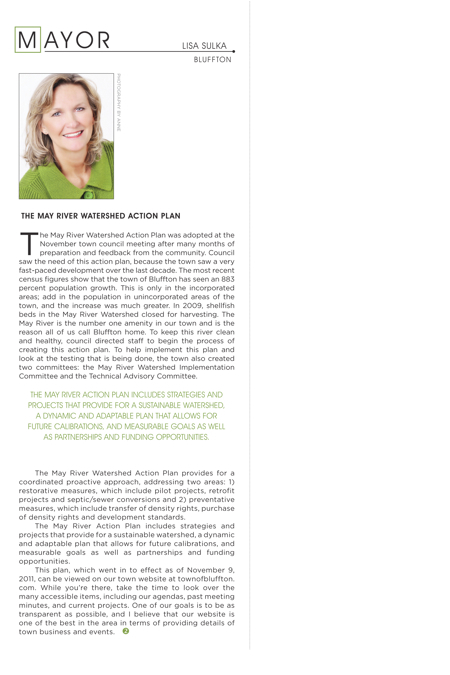 The May River Watershed Action Plan provides for a coordinated proactive approach, addressing two areas: 1) restorative measures, which include pilot projects, retrofit projects and septic/sewer conversions and 2) preventative measures, which include transfer of density rights, purchase of density rights and development standards. The May River Action Plan includes strategies and projects that provide for a sustainable watershed, a dynamic and adaptable plan that allows for future calibrations, and measurable goals as well as partnerships and funding opportunities. This plan, which went in to effect as of November 9, 2011, can be viewed on our town website at townofbluffton.com. While you’re there, take the time to look over the many accessible items, including our agendas, past meeting minutes, and current projects. One of our goals is to be as transparent as possible, and I believe that our website is one of the best in the area in terms of providing details of town business and events.